- Ultra thin about 3mm, and super light about 7g, reduce pressure on the nose bridge and uneasy to creep down. - Easy to store and carry,as portable as a card, fashion and elegant in the wallet. - TR90 frame, durable and great toughness. - Silicone nose pad, strong skid resistance. - Unique mini nose resting clip designed. 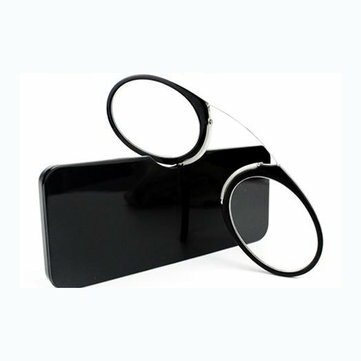 - You could stick the case of the glasses on the back of the phone with adhesive & sticker.